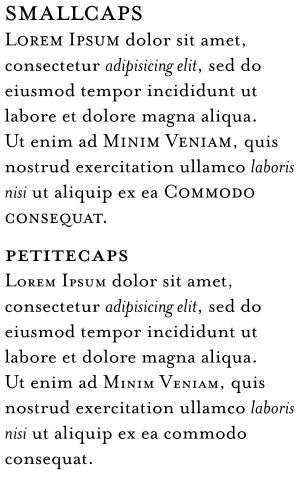 In typography, small capitals (usually abbreviated small caps) are lowercase characters typeset with glyphs that resemble uppercase letters ("capitals") but reduced in height and weight, close to the surrounding lowercase (small) letters or text figures. Note that this is technically not a case-transformation, but a substitution of glyphs, although the effect is often simulated by case-transformation and scaling. Small caps are used in running text as a form of emphasis that is less dominant than all uppercase text, and as a method of emphasis or distinctiveness for text alongside or instead of italics, or when boldface is inappropriate. For example, the "Text in small caps" appears as Text in small caps in small caps. Small caps can be used to draw attention to the opening phrase or line of a new section of text, or to provide an additional style in a dictionary entry where many parts must be typographically differentiated. Typically, the height of a small capital glyph will be one ex, the same height as most lowercase characters in the font. In fonts with relatively low x-height, however, small caps may be somewhat larger than this. For example, in some Tiro Typeworks fonts, small caps glyphs are 30% larger than x-height, and 70% the height of full capitals. To differentiate between these two alternatives, the x-height form is sometimes called petite caps, preserving the name "small caps" for the larger variant. OpenType fonts can define both forms via the "small caps" and the "petite caps" features. When the support for the petite caps feature is absent from a desktop-publishing program, x-height small caps are often substituted. Many word processors and text-formatting systems include an option to format text in caps and small caps, which leaves uppercase letters as they are, but converts lowercase letters to small caps. How this is implemented depends on the typesetting system; some can use true small caps glyphs that are included in modern professional font sets; but less complex digital fonts do not have a small-caps glyphs, so the typesetting system simply reduces the uppercase letters by a fraction (often 1.5 to 2 points less than the base scale). However, this will make the characters look somewhat out of proportion. A work-around to simulate real small capitals is to use a one-level bolder version of the small caps generated by such systems, to match well with the normal weights of capitals and lowercase, especially when such small caps are extended about 5% or letterspaced a half point or a point. Small caps are often used for sections of text that should be emphasized and where a run of uppercase capital letters would appear jarring to the reader. For example, the style of many American publications, including the Atlantic Monthly and USA Today, is to use small caps for acronyms and initialisms longer than three letters—thus "U.S." in normal caps, but "nato" in small caps. The initialisms ad, bc, am, and pm are often typeset in small caps. In many versions of the Old Testament of the Bible, the word "Lord" is set in small caps. Typically, an ordinary "Lord" corresponds to the use of the word Adonai in the original Hebrew, but the small caps "Lord" corresponds to the use of Yahweh in the original; in some versions the compound "Lord Godezh" represents the Hebrew compound Adonai Yahweh. In many books, when one part of the book mentions another part of the same book, or mentions the work as a whole, the name is set in small caps (sometimes typesetting small caps after transforming to Title Case), not italics and not roman type within quotation marks. For example, articles in The World Book Encyclopedia refer to the encyclopedia as a whole and to the encyclopedia's other articles in small caps, as in the "Insurance" article's direction, at one point, to "See No-Fault Insurance", "No-Fault Insurance" being another of the encyclopedia's articles. The OpenType font standard provides support for transformations from normal letters to small caps by two feature tags, smcp and c2sc. A font may use the tag smcp to indicate how to transform lower-case letters to small caps, and the tag c2sc to indicate how to transform upper-case letters to small caps. Most word processing applications, including Microsoft Word and Pages, do not automatically substitute true small caps when working with OpenType fonts such as Hoefler Text that include them, instead generating scaled ones. These applications must therefore work with fonts that have true small caps as a completely separate style, similar to bold or italic. Few free and open-source fonts have this feature; an exception is Georg Duffner's EB Garamond, in open beta. LibreOffice Writer started enabling true small caps for OpenType fonts since version 5.3, they can be enabled via a syntax including font name, a colon, feature tag, an equals sign and feature value, for example, EB Garamond 12:smcp=1. Although small caps are not usually "semantically important", the Unicode standard does define a number of "small capital" characters in the IPA extensions, Phonetic Extensions and Latin Extended-D ranges (0250–02AF, 1D00–1D7F, A720–A7FF). These characters, with official names such as latin letter small capital a, are meant for use in phonetic representations. For example, U+0280 ʀ (HTML &#640;) represents a uvular trill. As of Unicode 12.0, the only character missing from the ISO basic Latin alphabet is the small-capital versions of X.
Superscript small caps are the following: ᶦ ᶧ ᶫ ᶰ ʶ ᶸ. Combining small caps are the following: ◌ᷛ ◌ᷞ ◌ᷟ ◌ᷡ ◌ᷢ. Note that since these glyphs come from different ranges, they may not be of the same size and style, because few typefaces supply all of them. Since the CSS styles the text, and no actual case transformation is applied, readers are still able to copy the normally-capitalized plain text from the web page as rendered by a browser. ^ Smith, Margaret M. "The Pre-history of 'Small caps': from all caps to smaller capitals to small caps". Journal of the Printing Historical Society. 22 (79–106). ^ "OpenType Layout tag registry". Microsoft.com. 2008-11-19. Retrieved 2014-05-15. ^ Holman Illustrated Bible Dictionary. Nashville, TN: Holman Bible Publishers. 2003. p. 1046. ISBN 0-8054-2836-4. ^ ""Microsoft OpenType Layout tag registry"". Microsoft.com. 2017-01-04. Retrieved 2017-07-29. ^ Shaw, Paul. "The Evolution of Metro and its Reimagination as Metro Nova". Typographica. Retrieved 21 December 2016. ^ a b Heller, Steven. "Jonathan Hoefler on type design". Design Dialogues. Retrieved 2 August 2016. ^ Williamson, Hugh (1956). Methods of Book Design. London: Oxford University Press. pp. 75–104. ^ Hoefler, Jonathan. "Hoefler Text Font Features: Grand Italics". Hoefler & Co. Archived from the original on 15 April 2019. Retrieved 15 April 2019. ^ "What's OpenType?". Hoefler & Frere-Jones. Retrieved 11 August 2014. ^ Duffner, Georg. "Design of EB Garamond". Retrieved 11 August 2014. ^ "Release Notes 5.3". Wiki. The Document Foundation. Retrieved 29 December 2016. ^ "Opentype features now enabled? Documentation?". Ask LibreOffice. Retrieved 29 December 2016. ^ "Enumerated Versions of The Unicode Standard". The Unicode Standard. Retrieved 2019-04-10. ^ ""Microsoft OpenType Layout tag registry"". Microsoft.com. 2008-10-08. Retrieved 2014-05-15. ^ "OpenType feature support"". "Typotheque. Retrieved 2014-05-15. ^ ""W3C Working Draft Proposal: CSS Fonts Module Level 3"". W3.org. Retrieved 2014-05-15. ^ Hugh Williamson's Methods of Book Design (1956) notes that "one of the most conspicuous defects" of contemporary book faces was that they did not generally feature italic small capitals: "these would certainly be widely used if they were generally available". Exceptions of the time included Linotype's Pilgrilm, Janson and their cut of Monotype Garamond, and from Monotype Romulus. More have appeared since, especially in the digital period, such as in Hoefler Text.